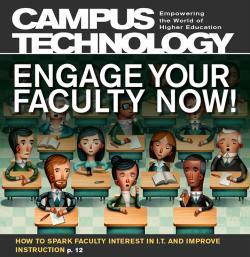 Cover Story — Engage Your Faculty Now! How to spark faculty interest in IT and improve instruction. In choosing between Microsoft's and Google's cloud offerings, schools must weigh issues ranging from regulatory compliance to interoperability. When Does Telepresence Make Sense? Why are some schools adopting room-based telepresence systems for distance learning? Colleges worldwide are revamping campus spaces to facilitate collaboration. Here's how. Technology can strengthen relationships between students and their campus. How to make your tech project a win--even without project management pros on hand. Login: IT Fail: Should Faculty Get the Blame?